Swedish power metal pioneers HAMMERFALL are pleased to announce a one off exclusive London show for 2015. The band will play the O2 Islington Academy on the 9th May. 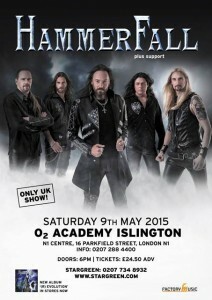 HAMMERFALL released their latest album ‘(r)Evolution’ last year via Nuclear Blast. Order your copy here. Watch their latest video ‘Hector’s Hymn’ here.